This was SO good! 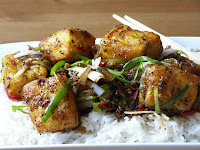 Recipe comes from Ching He-Huang on the BBC Good Food website, it was already vegan and I didn't have to make any changes. For that reason you'll have to click on the link there for the recipe. I love Ching, she always makes the most amazing looking food and love her show Ching's Kitchen - I could seriously watch that all day!! I'll be making this one again and again for lunch I'm sure, such nice flavour with the ginger and soy and a nice simple dish. Notes: I did make one small change - I halved the amount of red chilli flakes and found this to be a perfect amount. Nice heat but not overpowering. Also my sauce cooked down a little too much or too fast so I added a couple splashes more water to loosen it from the wok and get a bit more sauce. Otherwise I made no changes at all. 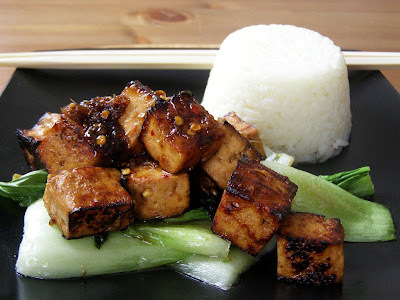 This dish is also a calcium powerhouse with the tofu and pak choi. 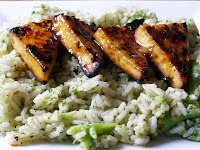 If you use calcium set tofu, one serving gives you 487mg of calcium! I also had mine with a glass of calcium fortified orange juice and together that gave me 670mg of calcium - in just one meal! I'm still discovering oriental flavours, but I have to admit this dish wins me over.